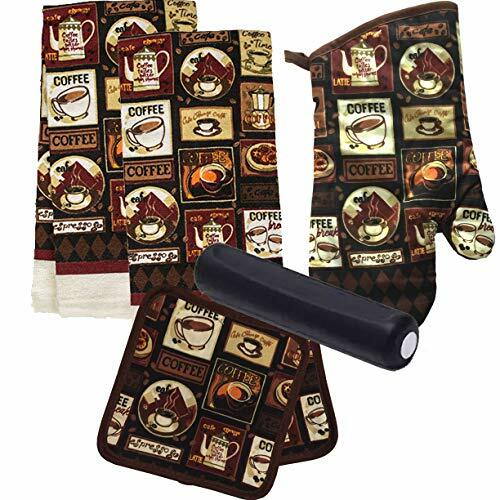 Brighten up your kitchen, outdoor patio or coffee nook with these coffee themed linens. These themed oven mitts and pot holders are 100% cotton (with Polyester backing) and are quilted. The mitts are designed to protect hands and wrists from hot surfaces, both the mitt and pot holder feature sturdy loop hooks for handy storage when not in use. Mitts are even sized to fit practically any size hand. Ideal for outdoor barbecues, indoor kitchens, restaurants, and bistro kitchens. Set Includes one (1) oven mitt, two (2) pot holders and two (2) dish towels and bonus spoon rest! If you have any questions about this product by Greenbrier, contact us by completing and submitting the form below. If you are looking for a specif part number, please include it with your message.